Ear ache is very common in children, particularly acute otitis media which is infection of the middle ear. 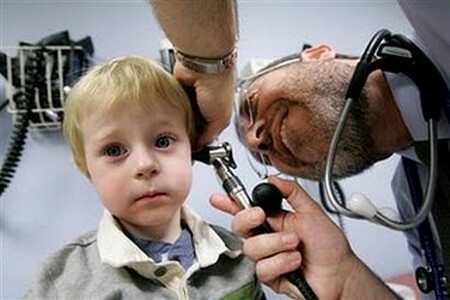 Younger children suffer more as the Eustachian tube, which connects the ear to the nose and throat, is still short and infection spreads more easily. Other causes may be toothache, tonsillitis, mumps or infection of the outer ear (otitis externa), such as a boil. Occasionally, the cause may be due to something such as an insect entering the ear. Ear ache causes a sharp, stabbing pain and may be accompanied by a discharge of pus, raised temperature and slight loss of hear­ing due to a build-up of fluid in the ear. Babies with ear ache may signal discomfort by pulling or scratching at their ear. Don’t try to stick anything down a child’s ear as this may push any foreign body or wax further down. Check the child’s temperature. Keep them warm and comfortable – placing a wrapped-up hot-water bottle on their pillow will soothe -and take care when washing so water doesn’t enter the ear. Acupressure If the ear ache is due to a cold or a change in pressure, such as during air travel, try pressure with two or three fingers (depending on how big the child is) on the area in front of the ears for two or three minutes. A naturopath may suggest that frequent ear ache may be due to a diet too high in mucus-forming foods, such as dairy products. If antibiotics have been given previously, the child’s immunity may be lowered and probiotics, such as acidophilus and bifidus, may be recommended to rebalance. A diet containing plenty of foods containing vitamins A as beta carotene, C, E and zinc may be recommended. The herbal remedy Muellin oil might be given, as a few drops into the ear every few hours can bring pain relief, or Lavender oil, rubbed behind the ears, may be advised. All the toes would be worked on which correlate to the head, but particularly at the ear point found at the base of the fourth and fifth toes which relates to the Eustachian tube. Other parts of the body may also be treated, such as the intestine, to help promote overall health. If the child becomes very sensitive to noise and has a raised temperature, a homoeopath may recommend Aconite or Belladonna for the acute, throbbing and pain asso­ciated with ear ache. Chamomilla may be given to soothe the pain when the face is red and the child distressed. For an acute attack, Ferr. phos. may work well. If there is a slight discharge from the ear, Calc. phos. may be recommended. Ear ache can lead to more severe problems such as glue ear or may affect hearing, so consult a doc­tor at the first signs. Other therapies that may be beneficial: osteopathy, chiropractic, aromatherapy.